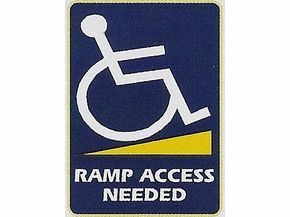 Ramp Access Needed - Interior Car Sticker. Stuck smoothly to internal rear screen with no issues,just hope people take not!!! Excellent product, will definitely use again if needed. The product is good I just wish it had been made clear in the description that it wouldn't be able to be seen if you have tinted glass in your window. Mine isn't visible at all. Afterwards on discovering this I found a product lower down the list that is visible with tinted glass I intend to order one of these.